On one midsummer day, Maureen was raving about food trucks. Although they have been occupying various spots with increasing frequency in Fort Collins over the past few years, I had yet to try any. Thus an opportunity for a mini-adventure was born. “We should do a food truck tour this summer,” I suggested. So over the next few weeks, we sought out those boxy kitchens-on-wheels, usually at lunchtime or midafternoon. The later afternoon timing actually foiled us as food trucks are apparently much less prominent then. Also, as many of the trucks do not have permanent locations, it was hard to find them as they often were not in places we last remembered seeing them. The typical go-to app for conventional restaurants–Yelp–also pointed us to vacant lots. Somewhat belatedly, we discovered a resource exclusively for food trucks, carts, trailers and stands: FoodTrucksIn.com. 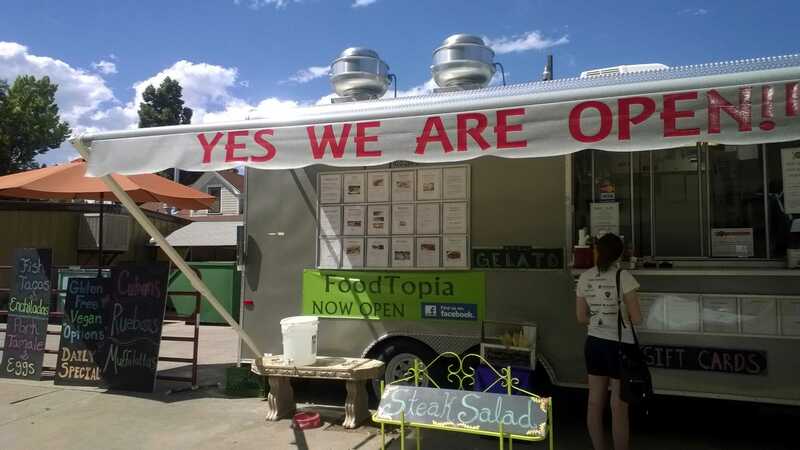 It lists food trucks in your chosen vicinity, sometimes maps them, and provides links to the vendors’ Twitter and Facebook pages (often useful for learning the vendors’ hour-by-hour locations). If you ever do your own food truck tour in the States, visit that website first. 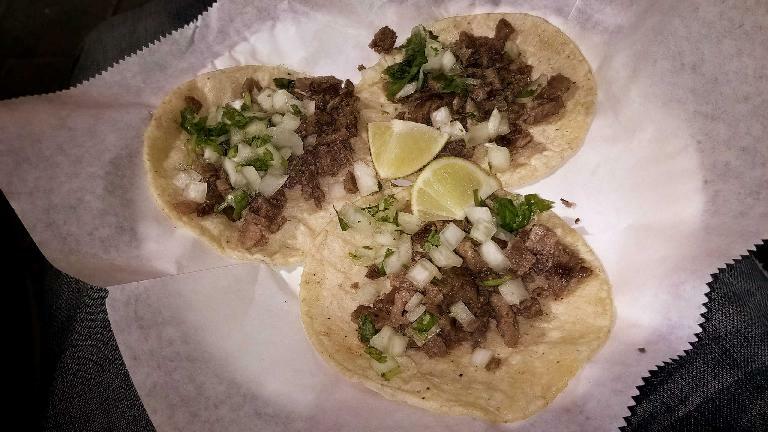 Tacos y Mariscos: This is a food truck in the parking lot of AutoZone on N. College Ave. that serves Mexican food. 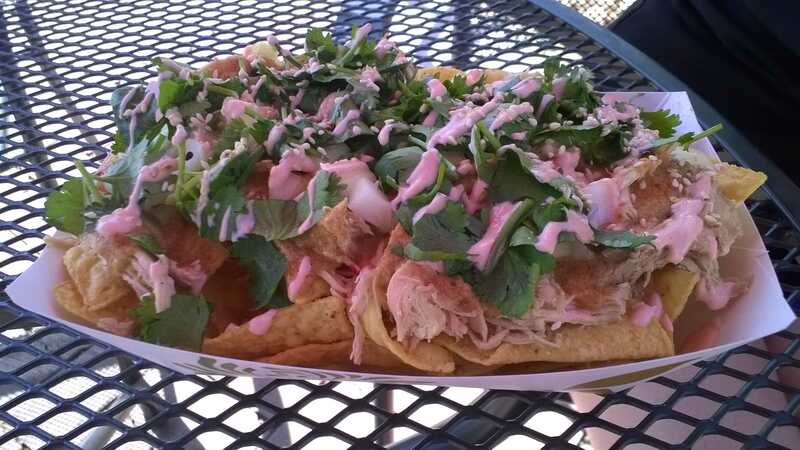 A couple people had advised me that this was the “best” authentic Mexican food for lunch in Fort Collins. We had chicken and beef tacos for $1.75 each. On a different day, we also tried their agua de horchata beverage (about $3, I think), which was a bit too sweet for my liking. 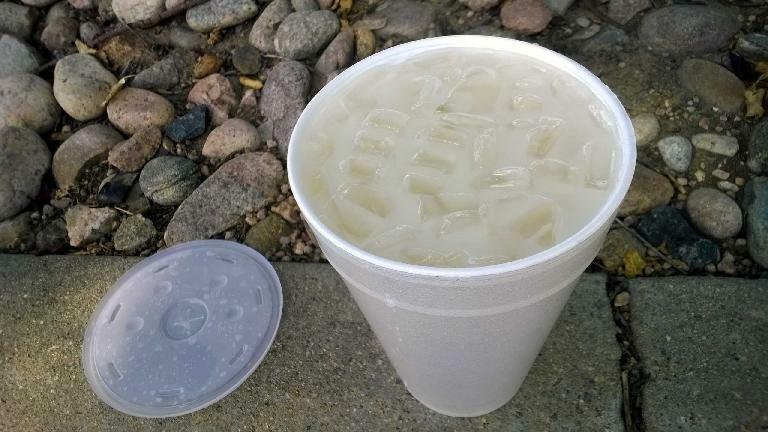 Horchata is a milky beverage made of ground almonds, sesame seeds, rice, barley, or tigernuts. Common-Link Food Truck: This one was outside of New Belgium Brewery. We tried their poutine—a traditional Quebecois snack comprised of French Fries, gravy, and cheese curds. I have occasionally wondered—such as on Canada Day—where it is possible to obtain poutine in Fort Collins, and here’s an answer. It was pretty good. Foodtopia: This food truck located at 424 Maple St. was only open for a week when we came upon it. It has an extensive menu that puts an exotic spin on otherwise somewhat mundane foods. 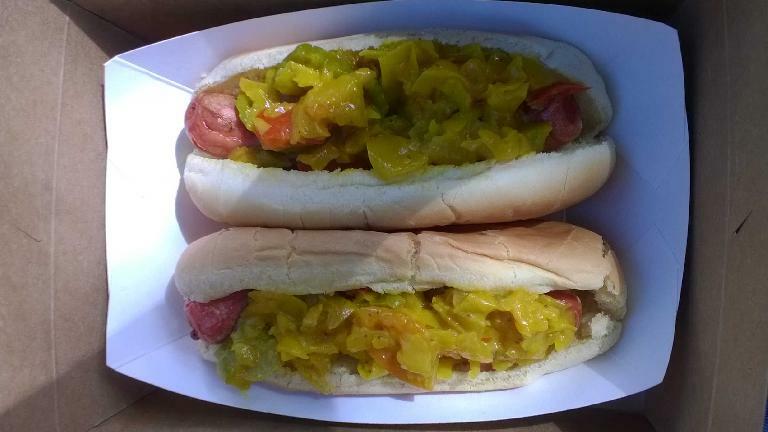 For example, Maureen and I had rippers with chow chow, which essentially were high-quality hot dogs with pickled relish ($4 each, I think). Delicious. 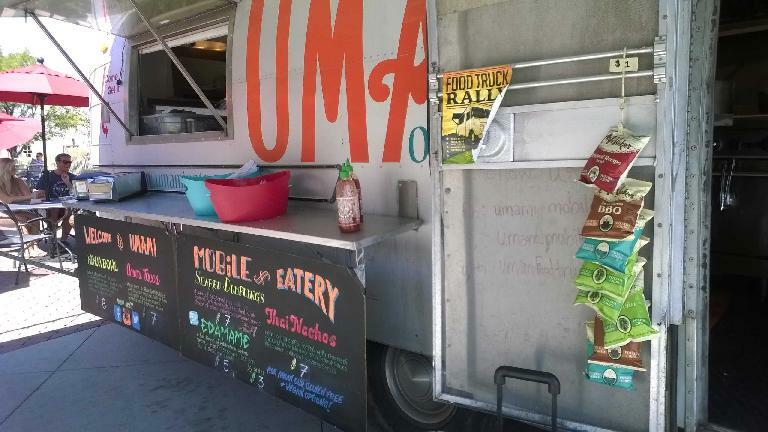 Umami Mobile Eatery: This food truck serves East Asian-inspired food and was located outside of Odell’s Brewery. 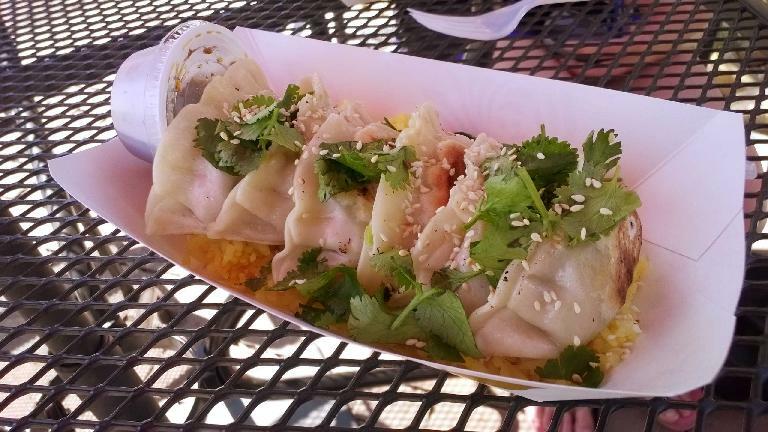 We ate Thai Nachos and Seared Dumplings here for $7 each. The Taco Stop: This food stand was located on the northeast corner of Oak St. and College Ave. in Old Town Fort Collins at night. I think they offered three steak tacos for $7 or $8. Not quite as cheap or good as Tacos y Mariscos, but not bad. There are undoubtedly more food trucks—indeed, FoodTrucksIn.com lists 14 in area code 80538 at the time of this writing—but that is all we had time to visit. 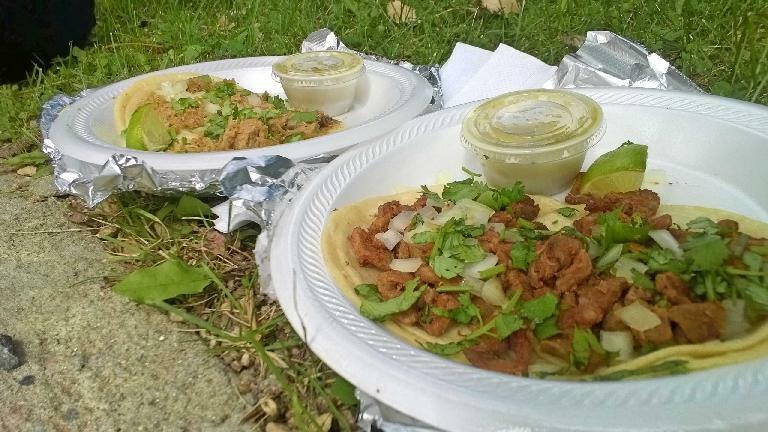 Food trucks are often a little less expensive than sit-down restaurants, but not vastly so. Since the mobile eateries’ overhead is undoubtedly far lower than conventional restaurants’, I am guessing their margins are much higher. And they usually charge quite a bit more than fast food chains like Taco Bell or A&W. The mobile food vendors—or at least the good ones—often provide unique dishes, often with their own spins on them, that you are unlikely to encounter in a mainstream restaurant. 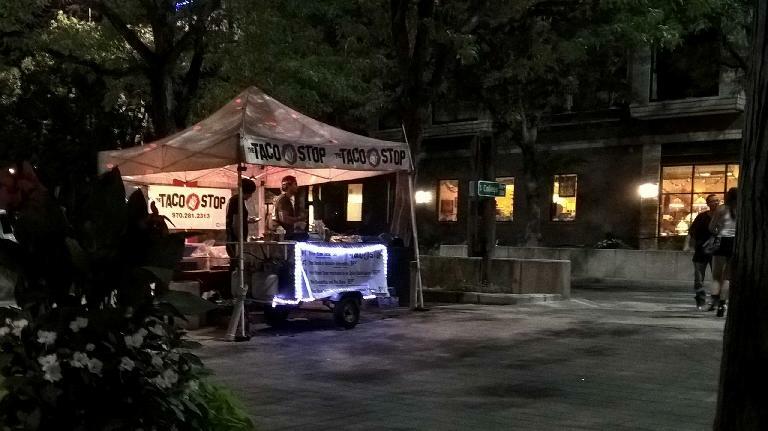 Food trucks probably have a more efficient business model than brick-and-mortar restaurants because they can shut down during off-peak hours and can relocate to places where business is likely to be good. In any case, our little “tour” left me feeling pretty enthusiastic about food trucks and I will be sure to try them in other locations as well in the future.